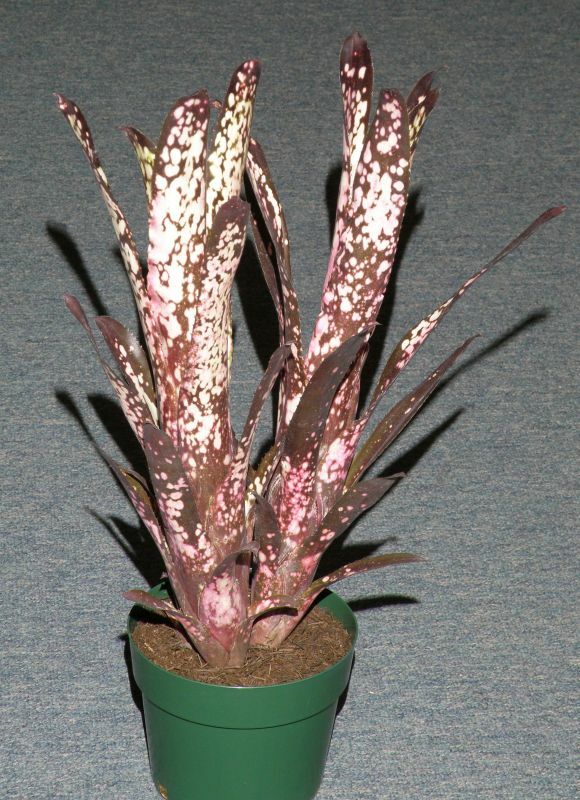 Dyckias, are generally one of the most cold hardy of all of the Bromeliad genera. While most people are scurrying around trying to bring in the last of their plants before the first blue norther hits, Dyckia growers can sit back and enjoy themselves knowing that most of their plants can take temperatures down into the low twenties, or even the upper teens. Those Dyckias are tough plants! Dyckia is one of the genera in the subfamily Pitcairnioideae. 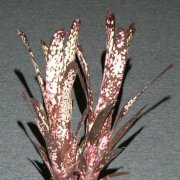 This subfamily contains some of the most primitive Bromeliad species. Most Pitcairnioideae genera are saxicolous (living on or around rocks) or terrestrial (growing in the ground), with Dyckias into both categories (e.g. D. saxicola), although most are strictly terrestrial and all do well when grown as strict terrestrials. The majority of the approximately 120 different species of Dyckia are native to central Brazil, with some being found in Uruguay, Paraguay, Argentina, and Bolivia. Most are found growing among rocks in warm sunny areas ranging in altitude from sea level to 2000 meters. The genus was introduced into Europe during the nineteenth century, and was named for Prince von Salm-Dyck, an early expert on succulents. Although Dyckias have no internal water storage tissue like true succulents, they are xerographic and survive long periods without water by going dormant. Their rosette of thick succulent leaves will eventually wilt, but recovery is rapid when watering is resumed. These plants are tough! They will withstand more neglect than almost any other commonly cultivated plant and still pup and bloom every year. Their only demand is a little water and a lot of sunshine. 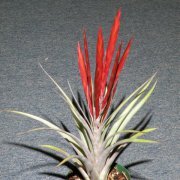 In the spring they bear multiple red, yellow or orange flowers on a thin stalk that emerges from the side of the plant. The stalk length can range from about 10 centimeters for a small species like D. choristaminea to more than 2 meters for D. maritima. Although the flowers aren’t large, bees, wasps and hummingbirds find them attractive. The plants themselves come in a range of colors (green, rose, maroon, tan, or silver), and a variety of leaf shapes (long and thin, short and fat, deeply lobed, or almost smooth). In an outdoor setting with considerable sunshine, these plants may be a welcome addition to your garden. For the most part, Dyckias are not demanding in their culture. Generally I have found the following conditions work well. They like full sunlight. 5000 foot-candles, 50% shade, is probably the least amount of sun that they can have and still flourish. They prefer temperatures in the range of 40-90 degrees Fahrenheit, but they will withstand much lower and higher temperatures. Most species will not be harmed by freezing weather if they are planted in the ground and given minimal protection. Use full a dilute fertilizer solution (¼ strength or less) with every watering spring through fall, but eliminate fertilizer during cold weather. When plants are actively growing in strong light, it is hard to over fertilize an established plant, but they don’t appear to suffer if they are not fertilized, they just grow more slowly. Although they will tolerate drought, they thrive on frequent watering while actively growing, however keep plants on the dry side during cold weather or during periods of reduced light. In the summer time they tend to dry out rapidly; it is helpful to keep them in a shallow container of water. Grow in a heavy mix that contains water retaining polymers and a large quantity of organic matter. 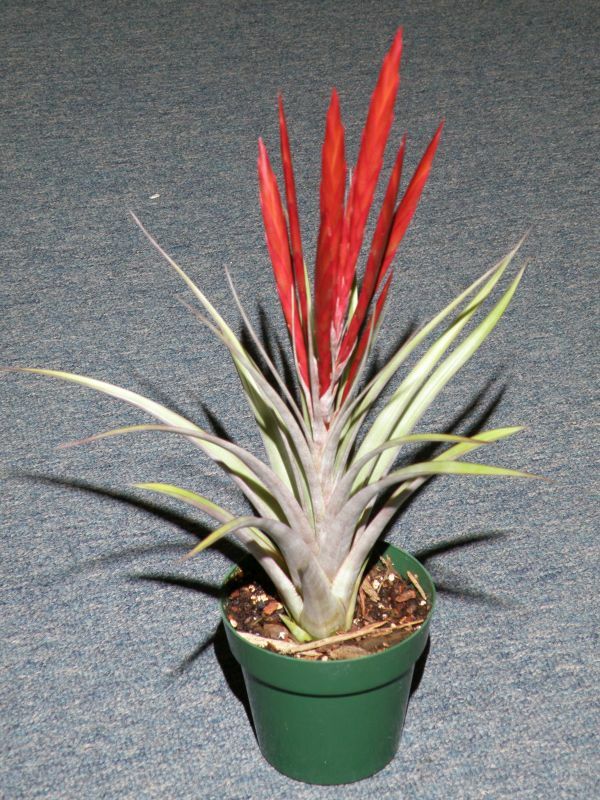 A mix similar to what would be used for a Cryptanthus or a Hectia would be appropriate. Dyckias probably do best when they are grown in the ground. Their ability to take temperatures in the 15-20 degree range makes them one of the best Bromeliads to use for landscaping in the Houston area. They should be able to take all but our most severe winter weather with only minimal protection. If you do choose to grow them in pots, use one that will accommodate the plant’s large root system. This is one plant that appreciates a pot that is about as wide as or wider than the plant itself. But WARNING: usually the larger the pot and the more the fertilizer the bigger the plant. Most Dyckia species have leaves armed with sharp spikes that make working with the plants painful. It is often difficult to separate pups from the mother plant. It is helpful to remove the plant from its pot and try to work on it from the bottom. You want to bring out the heavy equipment when dealing with your Dyckia collection. Leather gloves, a sturdy knife, a small saw, and, in extreme cases, a hatchet could all come in handy when it is time to separate and repot large clumps of plants. When you separate a pup, try to preserve as much of its root system as you can. If it has no roots, treat its base with rooting hormone before potting. In either case pot the plant in a fairly small pot using a well drained mix, and leave it there until the plant has a chance to establish itself. Most pups are slow to root and start growing, but when the plants root system fills the pot, move the plant into a larger pot using a heavier mix. If you want to try your hand at hybridizing, dyckias are good candidates. You need to remove any blooms that you don’t pollinate, and make sure that the plant is in a protected location since the birds and insects will be more than willing to give you a hand. When the pods are ripe, collect the seed and sow them in a well drained sterile mix. As the plants grow move them into increasingly larger pots. Grown from seed plants will usually take 3 or more years to bloom. Other than an occasional slug stopping by for a midnight snack, or a case of brown scale, or snails eating the delicate bloom stalks, insects don’t appear to bother Dyckias much. The most common disease problem is rotting off a plant because it was over watered during the winter.